The Little River rises in Sevier County inside the Great Smoky Mountain National Park on the north slope of Clingman’s Dome, the highest point in Tennessee. The river flows a grand total of 59 miles before joining the Tennessee River. But approximately one mile below its source, Little River absorbs several smaller streams at an area known as "Three Forks", where the river gains considerable strength. At this junction, the river begins to parallel with the Little River hiking trail. The river then continues on through Elkmont and then out of the park into Tuckaleechee Cavern in Walland, TN, where the river becomes more powerful. The river then flows into Rockford, where the water begins to loose clarity and becomes more like a typical rural river habitat. The Little River continues its journey on from Blount County until it dumps into Fort Loudon lake at the Tennessee River. The Little River is widely used by a variety of outdoor enthusiasts such as fishers, kayakers and swimmers alike. The beginning headwaters are to be merely observed and enjoyed, but further down the river where the flow begins to pick up are excellent areas for fishing and even further down, kayaking. Once the river flattens out past Walland, there are gentle spots for canoeing as well. 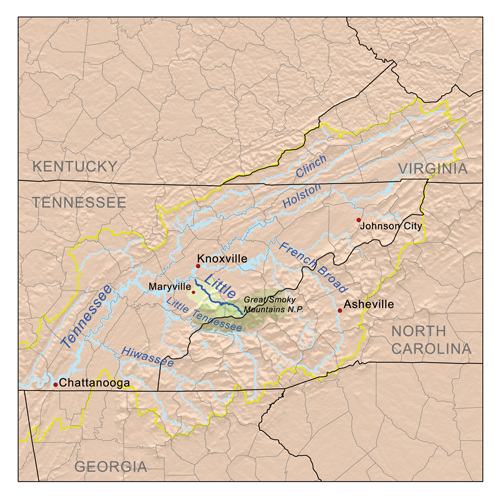 Because the Little River originates from a protected area, the Great Smoky Mountains National Park, its pristine waters are so clean it is a biodiversity hot spot for fish and other species. We know that the Little River is a clean habitat because some of the most sensitive fish species, darter fish, are able to survive there. In fact, recently a new species was discovered, the Percina Apina, which literally means "clean" or "without dirt"